We've Worked to Keep Mountain Home Beautiful for Over 50 Years! For the very best in tree care, maintenance, removal and more, trust the professionals at Graves & Sons Tree Experts LLC! We’re fully dedicated to providing you with top quality services, to keep your foliage looking its best. With decades of professional experience behind us, no one compares to our high levels of quality work. 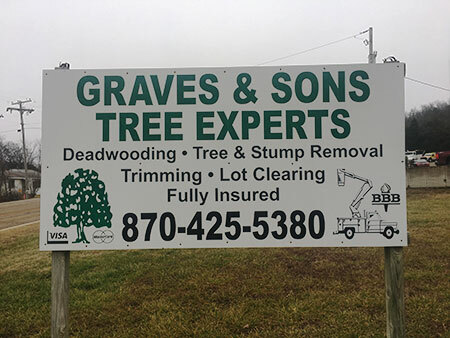 Graves & Sons Tree Experts LLC has been a proud family-owned and -operated business since 1966. We offer tree trimming, tree removal, stump grinding, and sick or damaged tree services for residential and commercial customers. We understand all too well that there are many reasons why your tree may need service, or as we like to put it, “tender loving care.” Our professional team has been handling your most complicated tree-related problems for over 50 years, and customer satisfaction is always our top concern. We’re proud to have served as your leading tree service in Baxter County, AR for 50 years, and we look forward to many more years in business. At Graves & Sons Tree Experts LLC, we are also dedicated to ensuring you receive superior customer service, which is why, from the first moment you call, we will do all we can to ensure your experience with us is an enjoyable one. We have a team of professional tree care specialists who know how to deliver only the best in quality tree service, with competitive pricing, ensuring you are left with a safe and beautiful arboreal environment. Stop shopping around for a better price, and get in touch with Graves & Sons Tree Experts, LLC for your next Baxter County, AR tree trimming! Here are just a few reasons why you should. We are a proud, local, family-owned and -operated small business. We have been proudly serving our community for over 50 years! 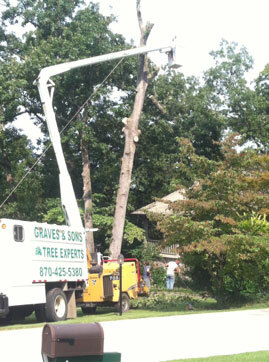 Our team includes professional tree care specialists. We offer a wide range of services, including tree trimming, tree removal, land clearing and more. We offer competitive pricing, and we’re happy to provide free estimates. Certificate of workers compensation and general liability insurance furnished. If you’re looking for professional tree services, done to the fullest levels of excellence, please contact Graves & Sons Tree Experts, LLC today to learn more about our great services!